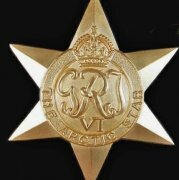 Relatives of those who served on HMS Glorious, Ardent & Acasta during the Norwegian Campaign are entitled to claim the Arctic Star. The earlier issued Arctic Emblem is also available to be claimed at the same time. One medal and emblem per serviceman can be claimed from the Ministry of Defence, using the application forms and certificate of kinship form that can be found as attachments below. The certificate of kinship form must be filled in and sent with the application.